A staggering discovery on the giant moon could lead to a breakthrough in the search for life outside of our planet. 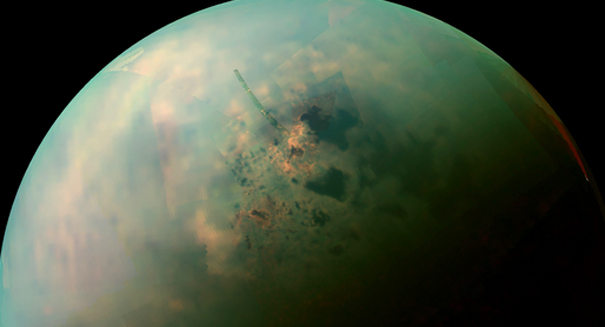 Scientists have just made a big discovery on the surface of the Saturn moon Titan that could represent a tremendous step forward in the search for alien life. Researchers have long studied the huge moon because it is one of the best candidates for life in our solar system, and now they’ve found evidence of vinyl cyanide molecules that could form cell membranes that could survive the moon’s liquid hydrocarbon seas. Although scientists see tremendous potential for life on Titan, they ran into the problem that all life on Earth is oxygen based and any life on Titan would have to be methane based. But the cells we know of here on Earth use fatty molecules called lipids to stay together, something that couldn’t survive on Titan. This discovery means there’s an alternative molecule, the vinyl cyanide molecule, that could work instead in a methane-based environment. It’s a tremendous finding that hopefully indicates that Titan, which is believed to contain all sorts of complex organic compounds necessary for life, could be a breeding ground for some type of life that would revolutionize science were it to be discovered.